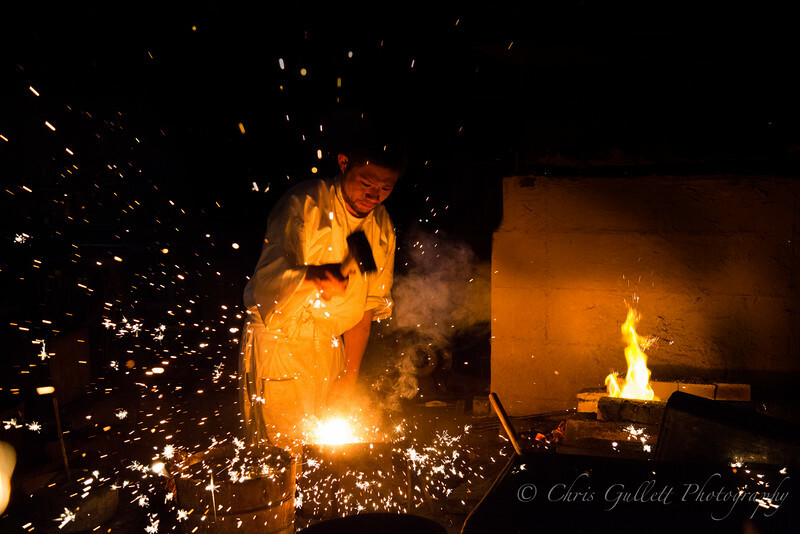 This gentleman is a very rare master Japanese sword smith. He is a 25th generation smith, and legacy of the Kanefusa family tradition. His swords command extremely high prices, and are coveted by CEOs of large Japanese companies, very serious collectors and practitioners of Japanese martial arts. Permission to photograph him in Japan is a privilege rarely permitted. I like how the smiths fist and hammer are visible at the heart of the explosion in this photo. 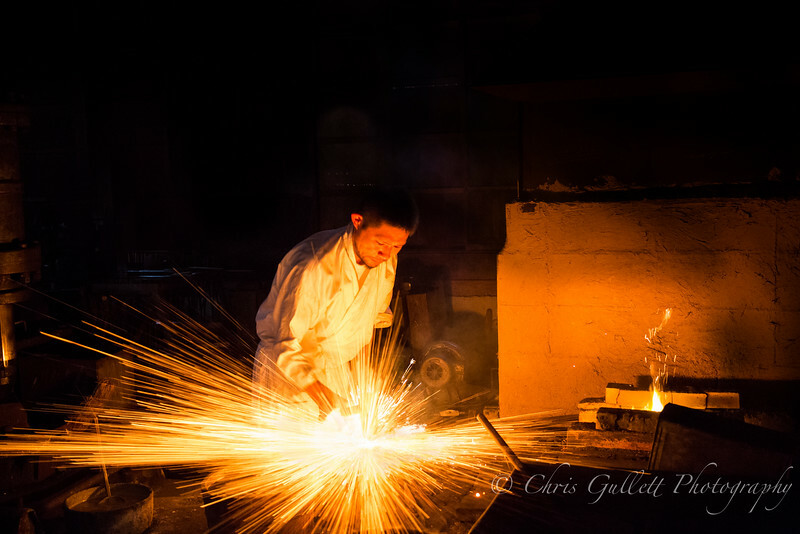 The smithy is kept dark so that the smith can judge the temperature of the metal by the intensity and color of its glow. 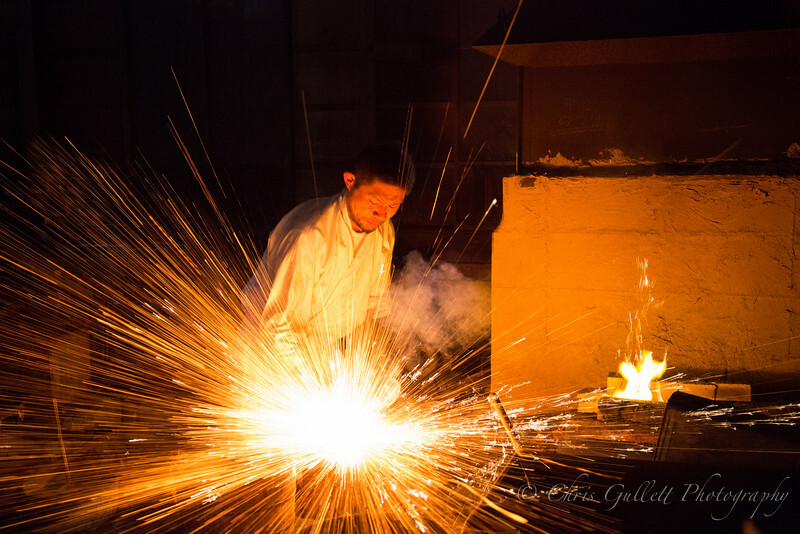 Fusataro San is a master Japanese sword smith. Permission is rarely given to allow photography of this ancient craft in its indigenous setting. This explosion peppered my face and camera with white hot steel sparks. 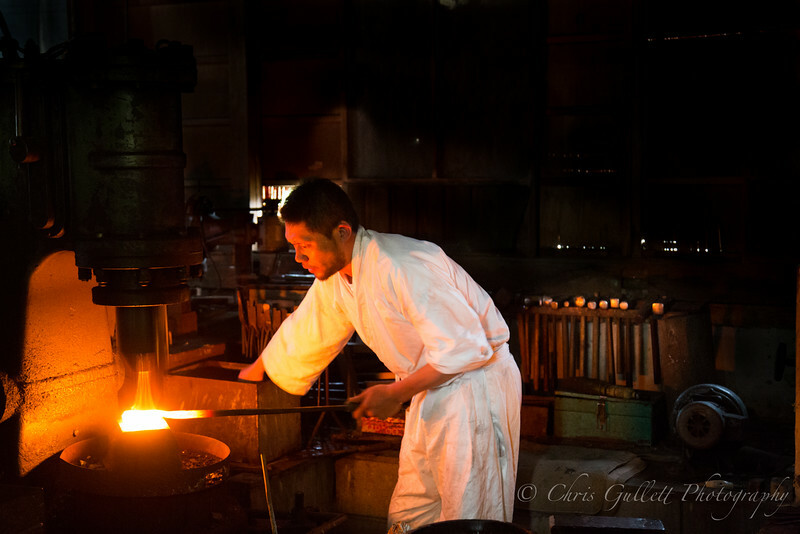 This master Japanese Sword smith pounds energy into the living steel. The master smith lectures on the qualities and composition of the Japanese sword. 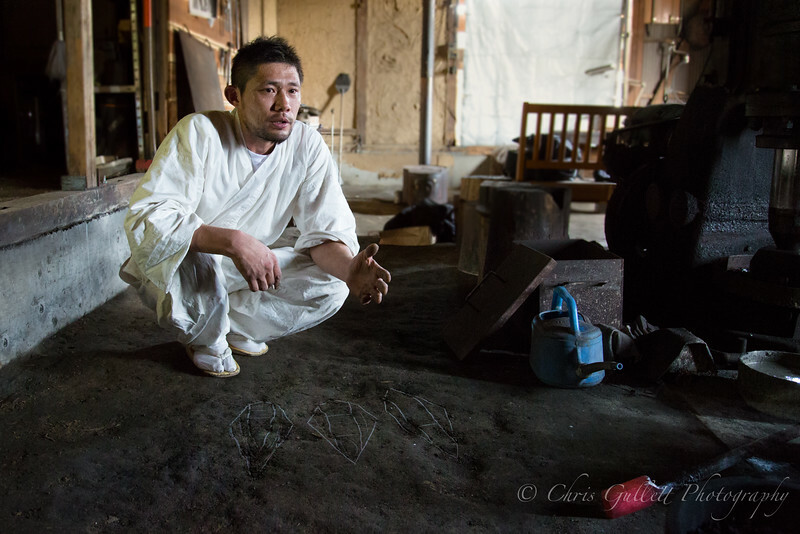 He made the quadrangular chalk drawings in front of him to represent cross sections of a katana. The internal geometries represent different areas within the blade that have different qualities, hardnesses, compositions etc. A lifetime must be spent to master this art, and I was fortunate to have a days lesson with this gifted man. The master smith lectures on the qualities and composition of the Japanese sword. 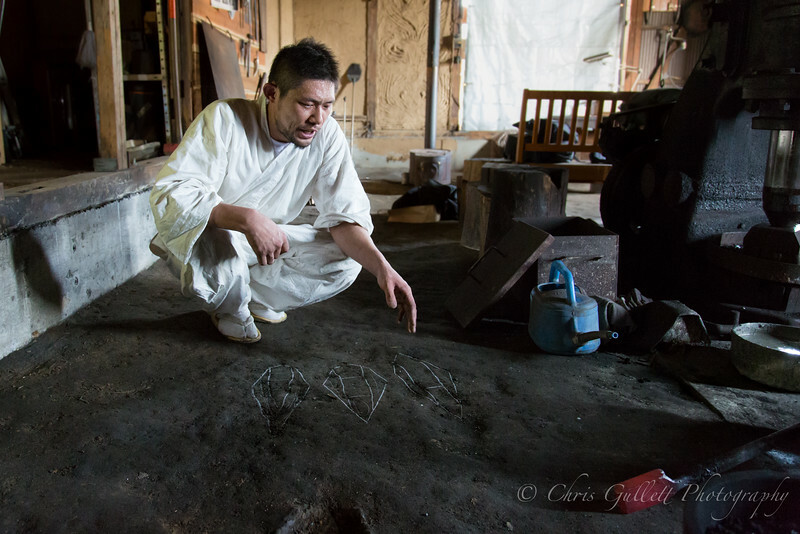 He made the quadrangular chalk drawings in front of him to represent cross sections of a katana. The internal geometries represent different areas within the blade with different qualities, hardnesses, compositions etc. Note also the still glowing steel ingot in the lower right corner. A lifetime must be spent to master this art, and I was fortunate to have a days lesson with this gifted man. 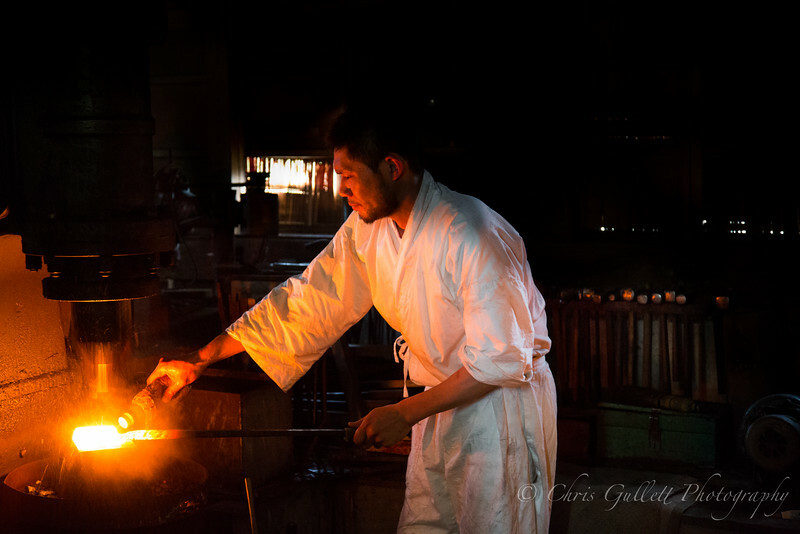 Although later refining of the steel is all done meticulously by hand and hammer (see the hammer rack glowing behind him), this power hammer is used in the early processing of the tamahagane ingot. Although later refining of the steel is all done meticulously by hand and hammer (see the hammer rack glowing behind him), this power hammer machine is used in the early processing of the tamahagane ingot.